We Google WHAT The Most In Iowa?! I mean, I am not sure it's a good idea to rely on Google as your life coach but, that isn't stopping anyone. 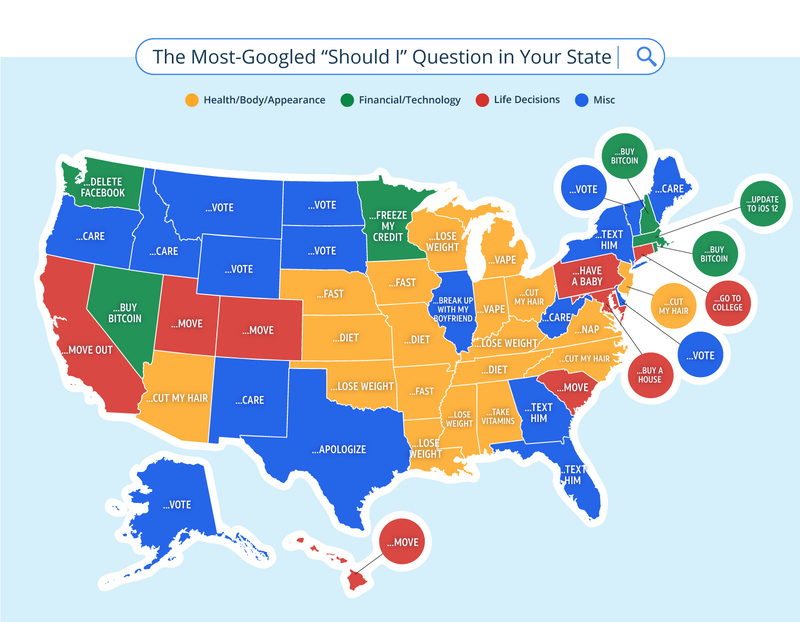 A new study done by AT&T found the question starting with 'Should I...' that people Google the most in every state. So what did we Google most in Iowa? Really? Maybe we're getting a jump on resolutions. 2. 'Should I nap?' in Virginia. 3. 'Should I cut my hair?" in Arizona, New Jersey, North Carolina, and Ohio. 5. 'Should I apologize?' in Texas. 7. 'Should I text him?' in Florida, Georgia, and New York. 8. 'Should I care?' in Idaho, Maine, New Mexico, Oregon, and West Virginia. Wanna see more? Check out the full map HERE.